Back to work tomorrow. It’s been a great couple of weeks. Spin, ply, dye, and a little bit of knitting. And cook, eat, swim, fish, teach, read, visit, and relax. Amd i didn’t check my email once! I had a random bag of Coopworth roving in my stash, not quite sure where it came from. Coopworth is the breed of sheep and roving means that it had been prepared for woolen spinning on a carder. 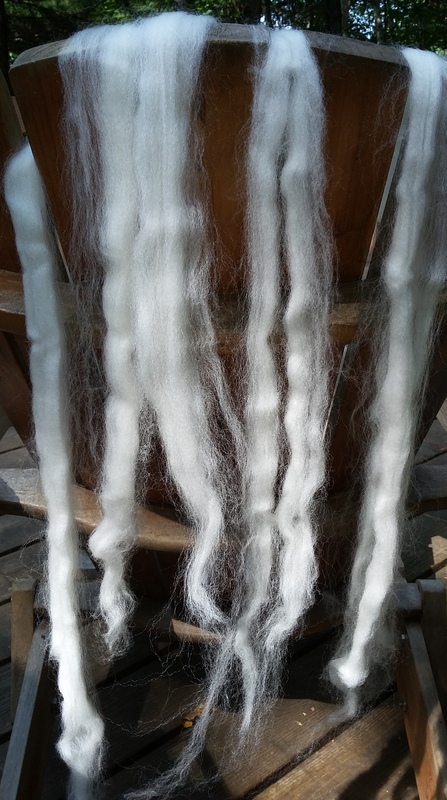 It definitely wasn’t as soft and luxurious as the Polwarth I had spun before it but the write-ups on the net described it as spinning up lustrous with good stitch definition and a halo. Strangely, this language actually means something to me now as I learn more and more about spinning. It did spin up nicely. 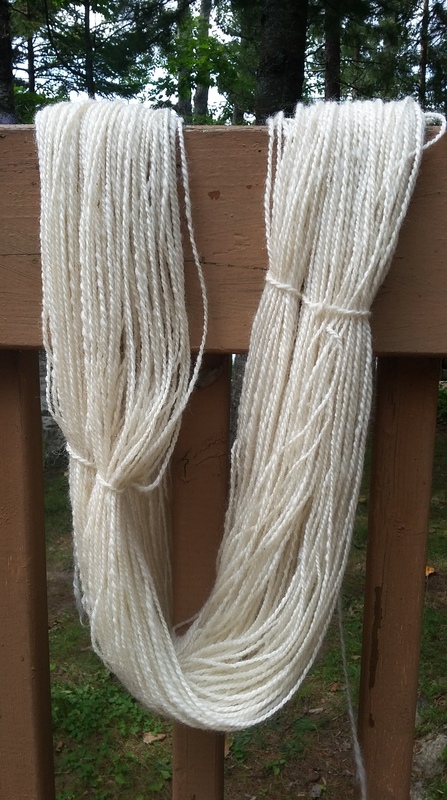 I ended up with 265 yards of a mid-weight 2-ply yarn. After my dyeing adventures earlier in the week it looked like a blank canvas just waiting for colour. I wanted to try to dye it 3 colours so that it would produce a verigated stripey effect when it knit up. I hadn’t done this before so I did a couple of experiments on small bits of yarn to see how it would work. 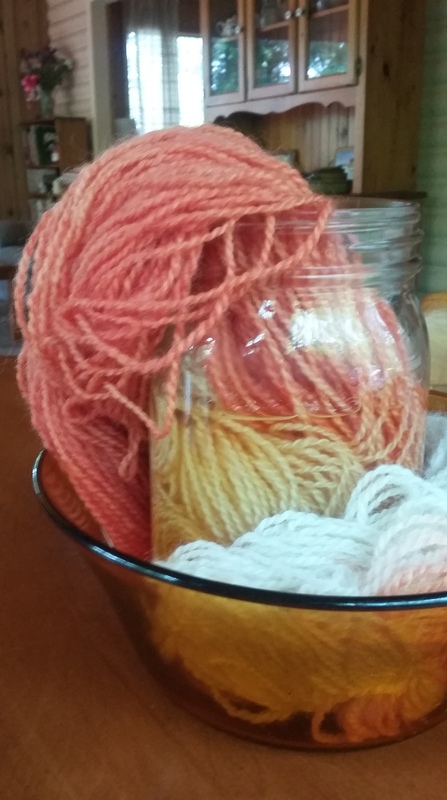 I first mixed some orange dye in a mason jar by adding yellow and red food colour and vinegar to hot water and then submerged 1/3 of the skein of yarn in it. 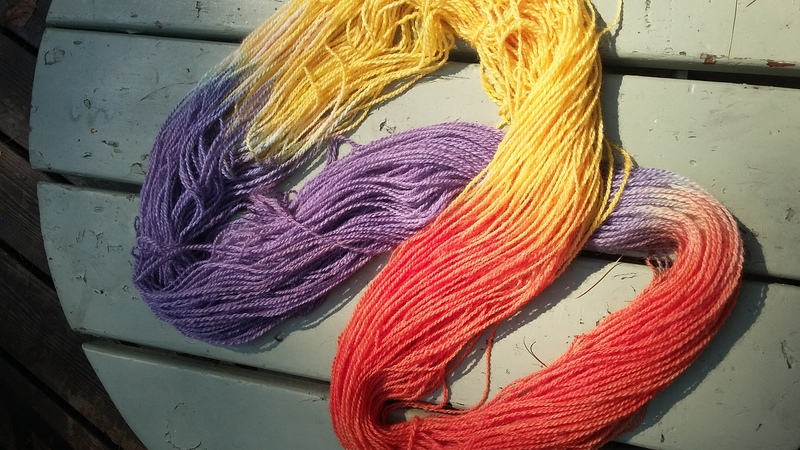 The microwave added the heat and vinegar helped the dye set in the yarn. When it was as orange as I wanted, I took it out and dipped the next third of the skein into the same jar. 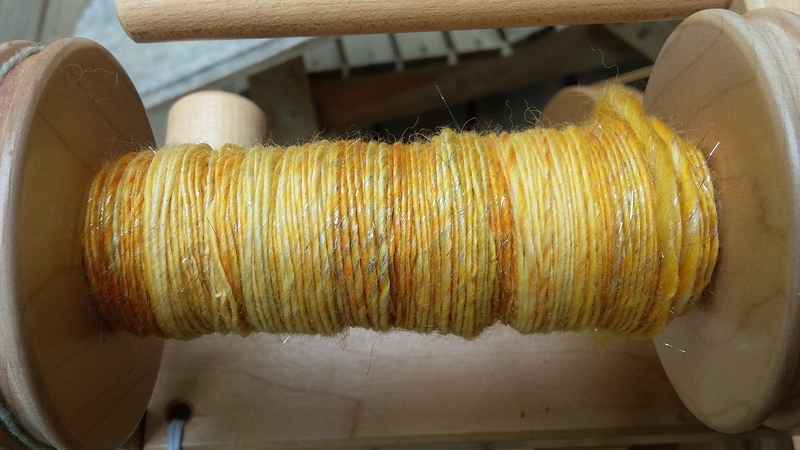 There was enough goldy-yellow dye left in the water to colour the yarn a nice soft creamy yellow. For the final step, I mixed a new batch of soft purple dye by combining red and blue and repeated the microwave process. It’s currently hanging in the breeze on the front deck drying. I can hardly wait to knit it. I think it worked out pretty well, considering that i started with a bag of random sheep hair and hardly any experience dyeing:) The 2 dye tests were definitely beneficial, I’ll try to remember to do that for future projects. And I’ll try to remember to post a pic of whatever I end up knitting with it. 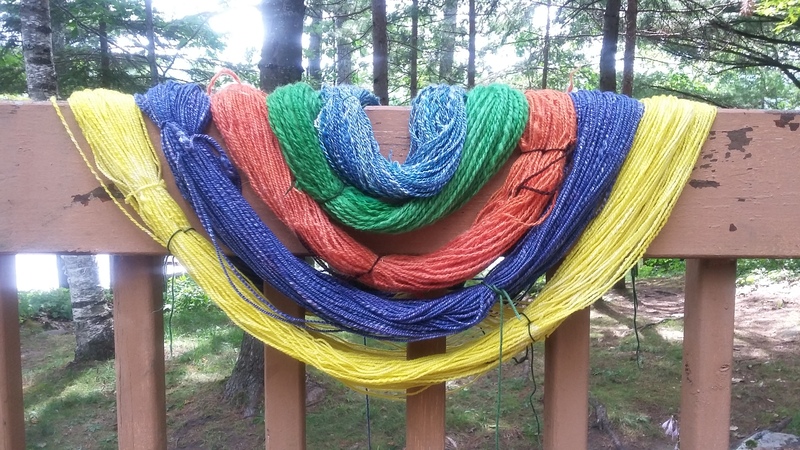 Back in July my friend and I went to Haliburton School of Art and Design for a week long intermediate spinning course. 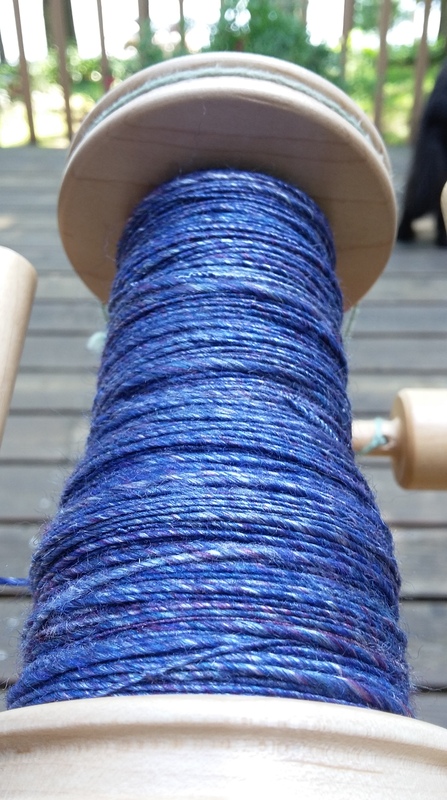 It was awesome to be in a roomful of people for a whole week who didn’t say “You do WHAT?” when I mentioned that I like to spin yarn for fun. 🙂 We got there early every morning and stayed late. I learned so much and my spinning improved greatly during the week. I used to think that by just putting more ‘miles on the wheel’ I would get better but good teachers make a world of difference. Now it’s mid-August and I’ve had nearly 2 weeks at the cottage, spinning every day, including a dye-day when my friend Stephanie came over and we tried all sorts of dyeing techniques. Some of it even worked out the way we had intended and some were surprisingly nice mistakes. Some we won’t mention again 🙂 It’s all about learning, both how to do it as well as what we prefer. This isn’t the colour I had hoped for at all but it’s growing on me. And the gold/yellow yarn on the bobbin above that was an afterthought. 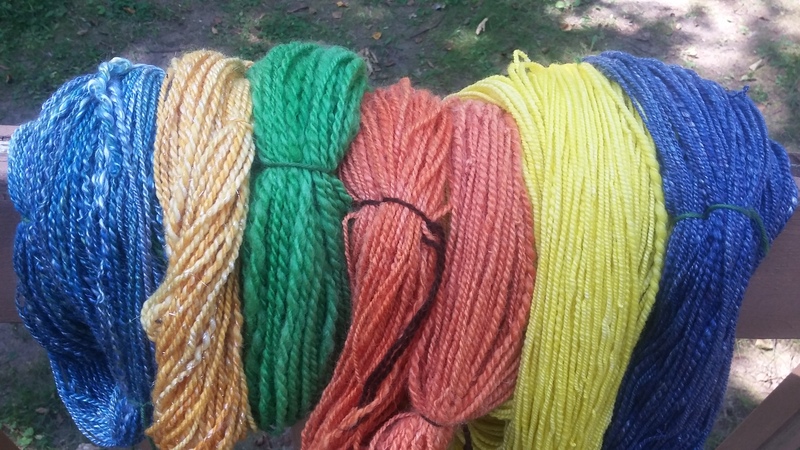 I threw a handful of wool into a dye pot I had used to dye some orange wool and that’s the result. Probably my favourite of the day, never to be repeated. 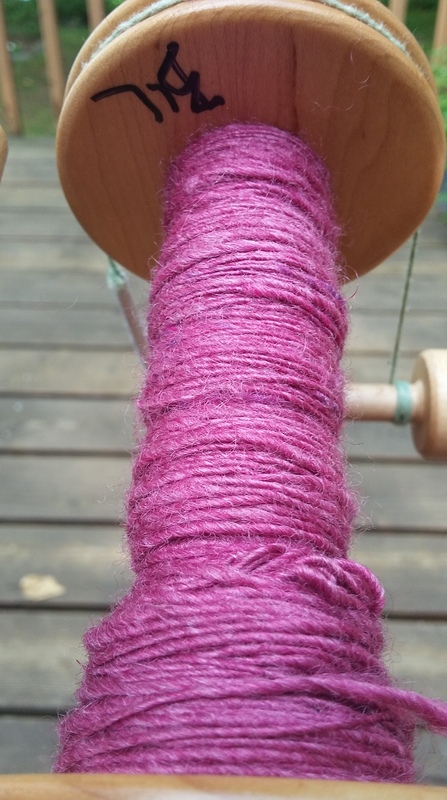 When I started spinning this wool (coopworth) I thought I didn’t like it at all. 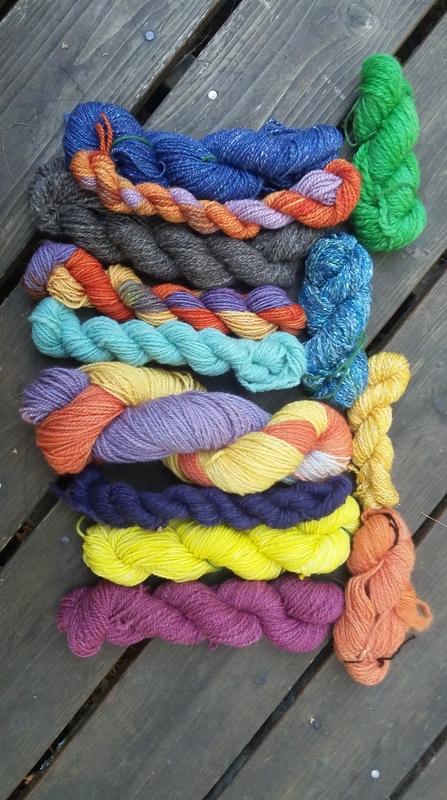 It felt harsher and harder than the lovely luxe merino and polwarth that I’d been playing with. Now that it’s spun and washed I love it. And it looks like a blank canvas to me. I can hardly wait to dye and knit it. I’m on vacation this week and next. So far so good. The other day my friend BK called to ask if I wanted to go fishing. We went to a little lake where the perch and bass almost jumped into the boat and we caught a good haul. Yesterday for lunch we had perch tacos with all the fixings. Last night we had bass with corn, rice, peas, and carrots. 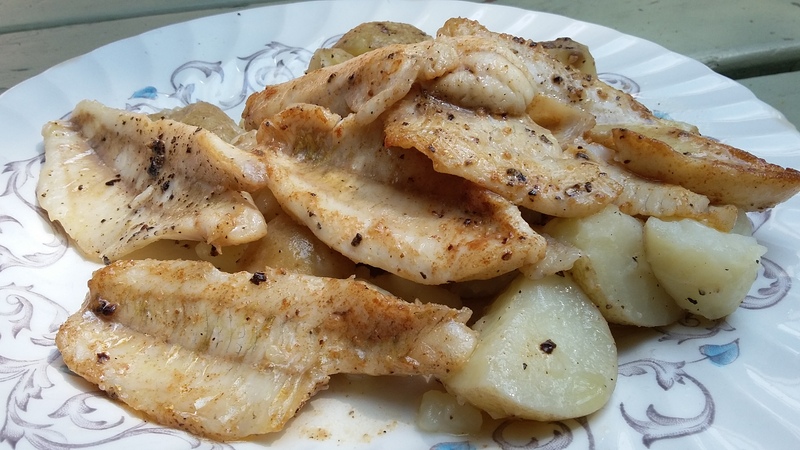 Today’s lunch was simple pan fried perch with boiled potatoes. And there’s still a little perch left. I might cook it up for dinner along with the crispy Thai pork lettuce wraps that I have planned. Cooking every day is one of the great joys of my vacation. I’m also spinning and knitting every day. I could get used to this.